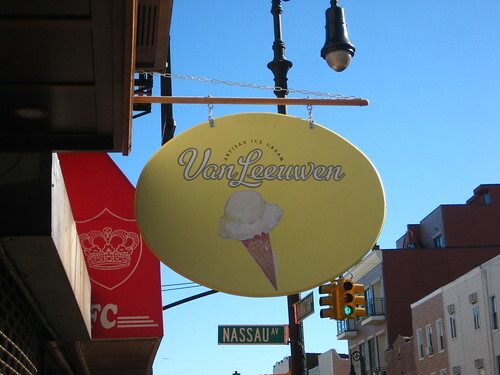 Not only does Greenpoint now have Paulie Gee's, we also recieved the only Van Leeuwen Ice Cream shop. Added bonus: Paulie Gee is serving Van Leeuwen, for when I'm so lazy I don't feel like walking nine blocks for dessert. Lucky for me, Ginger did feel like taking the stroll and our reward came in the form of Giandujia. Yes, after three pizzas and some beer at Brouwerij Lane, the only thing a girl needs before continuing her night is a hot fudge sundae. This was absolutely the best I've ever tasted Van Leeuwen's ice cream, the option of being able to savour my ice cream while sitting in the shop only adding to the experience. The interior is adorable and homey with only a few touches of the Van Leeuwen yellow. But you're not there for design, you're there for ice cream. 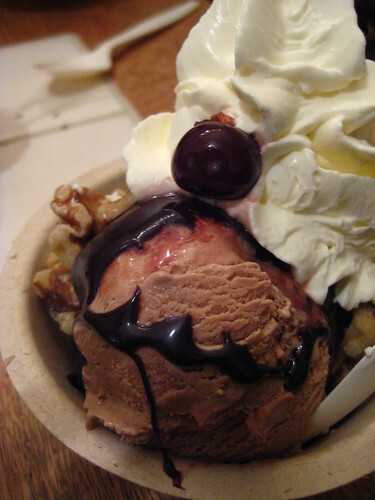 My Giandujia was creamy, velvety smooth hazelnut chocolate goodness, perfecting complementing the hot fudge. And even though I got the end of a whip cream bottle, it was still awesome. The freshness and homemade taste came through more than ever, maybe it's because you can sit there and chat, maybe it's because they don't have to worry about the variables that come from being on a truck.